The question doesn't need too many explanations, but the following picture illustrate the problem very well. I sort of understand why they don't match on width. The satellite drifts away of its path and once in a while it is brought back on the center of the WRS2 path. On the row though, the image is just cut by the processing software on the ground, so why don't they cut it to match exactly the WRS2 rows? How do they take the decision of where to cut? For me it would have made sense to cut according to the WRS2, but they are obviously not doing this. The way I noticed this problem is that the 2 images corresponding to 181028 and 182029 should not overlap, but they actually do a bit. This image is georeferenced in UTM 35N, which corresponds to the projection of the 2 images. 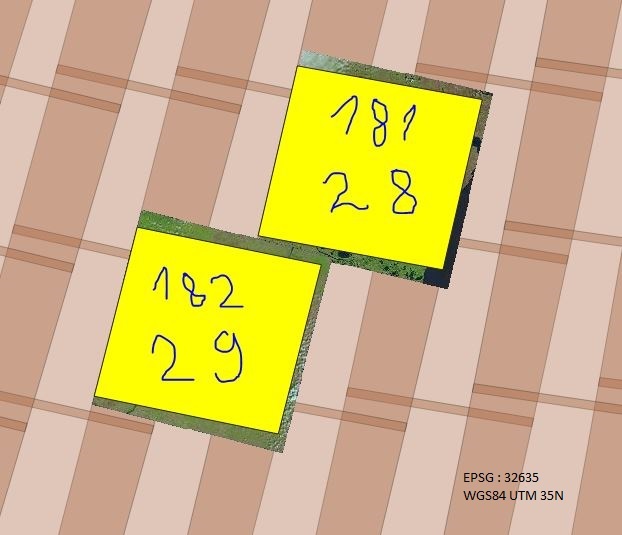 If you want to recreate exactly the image above, you can download the WRS2 shapefile and the 2 images from the following websites and load them in QGIS. Browse other questions tagged landsat landsat-8 or ask your own question.